We give you the esse​​​​ntial information you need to know before flipping a house. See Pricing & Enroll Now! Mike helped me avoid the problems which can sink new investors. I went on to spend over $20,000 on books, CD’s and real estate coaching programs. It was expensive but I stuck with it, and I ultimately learned the essential information anyone would need to get started in the house flipping business. Since then I've flipped over $2 million dollars worth of properties, and I often have multiple flips going on at once . I always knew that once I had built up a successful business, I would start to formally teach others how to do the same. House Flipping School is my way of helping people like you build wealth, gain personal freedom and restore communities-one house flip at a time. "Building wealth is about learning how to allow abundance into your life." 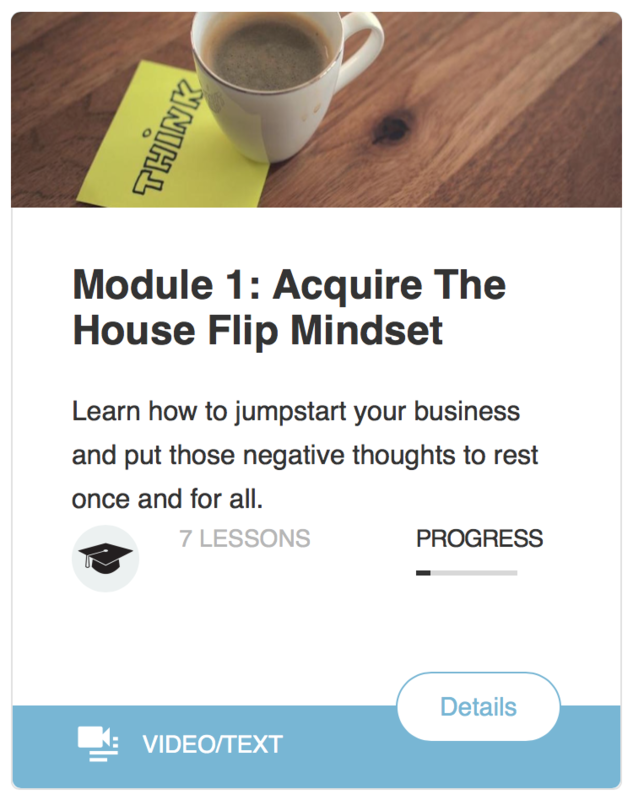 The "house flip mindset" is a way of being. It's a state that naturally allows wealth and abundance to flow into your life. Acquiring the house flip mindset is the foundation and cornerstone of a successful career in house flipping. Trying to flip a house by yourself is like trying to win a football game without a team. House flipping is a team sport, and it's next to impossible to flip multiple houses on your own. 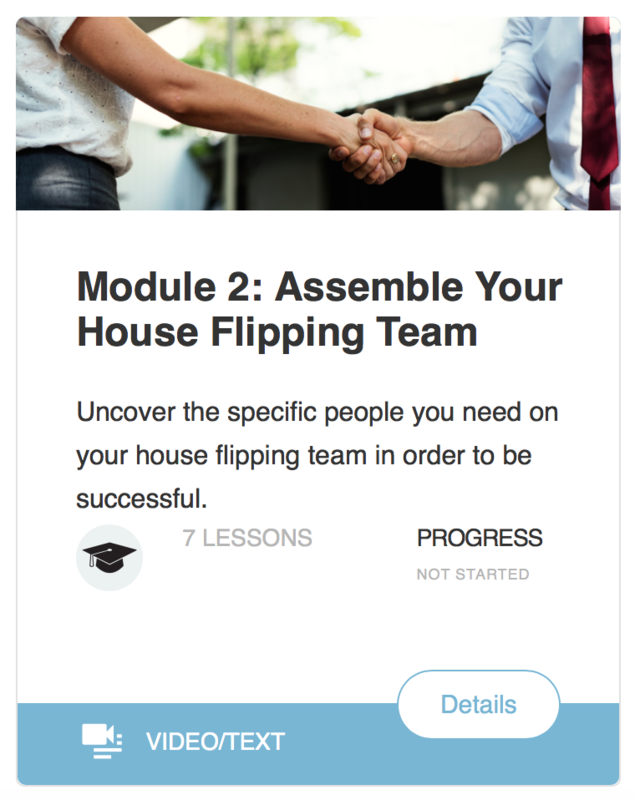 This module shares with you the expert profressionals you absolutely need to have on your House Flipping Team. These include contractors working in your target market. Then we tell you specific ways of meeting these experts, gaining their trust and ultimately building long-term relationships that are mutually beneficial (and make you both $). The ability to locate profitable deals is absolutely critical to house flipping success. There's usually lots of competition from other investors over the most profitable properties in any given area. 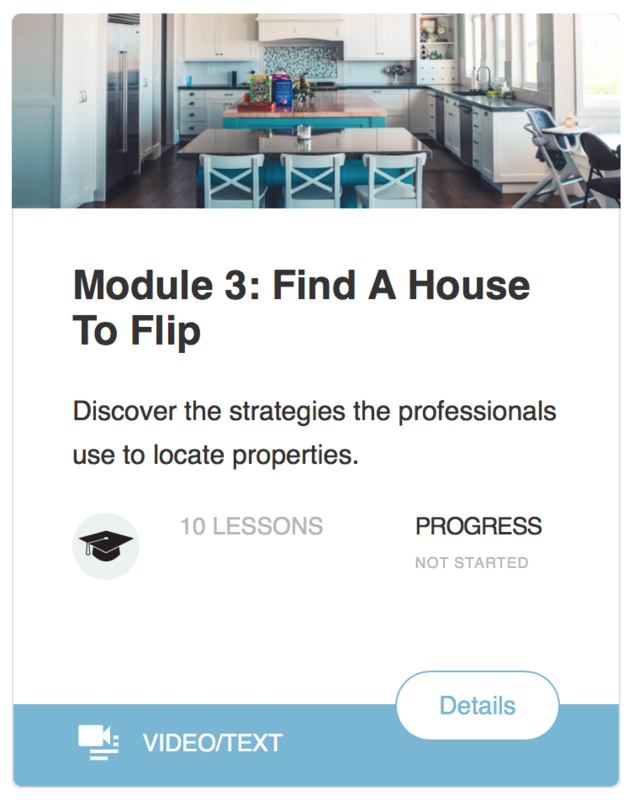 In Module 3 we give you the strategies we use to consistently find houses to flip, month after month, year after year. Contains 7 text lessons, 1 audio lesson (26 min), 1 video lesson (80 min) + assignments. Learn the truth about what it takes to flip a house without using any of your own money. 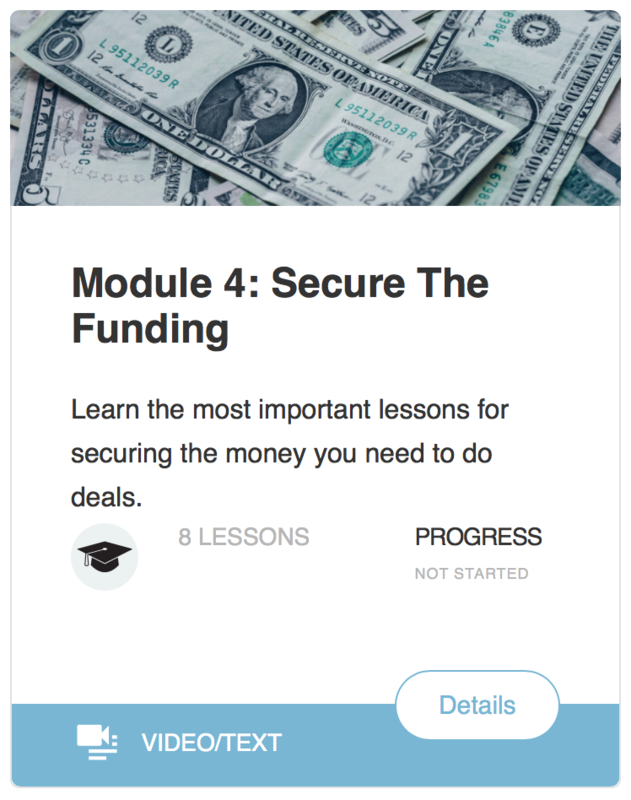 In Module 4 you will learn how people use partners, credit cards, hard money, private money and traditional banking to fund their deals. In addition, you will learn how we create streams of reliable sources of capital, to fund ongoing and future deals in our own businesses. Contains 5 text lessons, 1 audio lesson (37 min), 1 video lesson (72 min) + assignments. "Correctly analyzing deals is arguably the most important aspect of flipping houses." 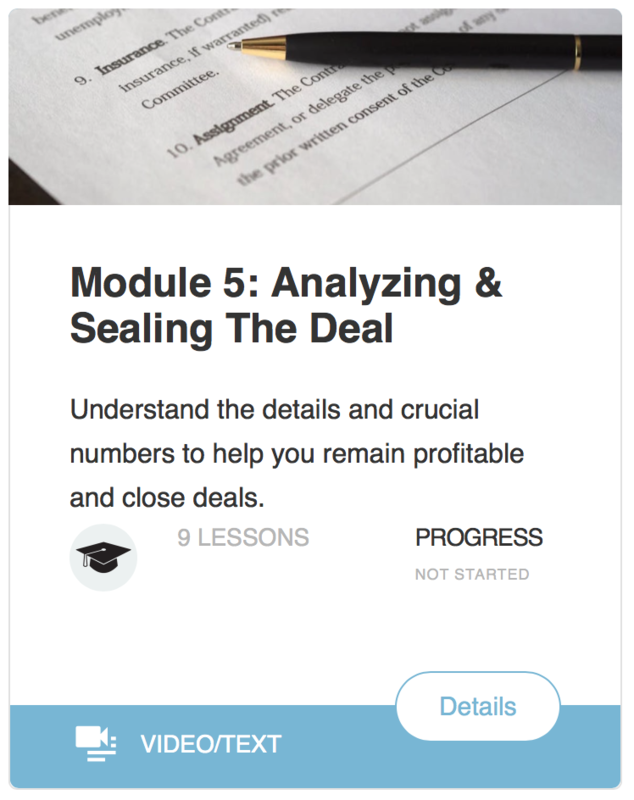 Module 5 can help you avoid making an error that could sink your entire business. You'll learn how we determine accurate after repair values and how we develop precise comparative market analyses. How we "run the show", handle change order forms and how we decide whether or not to hire someone else to run the entire project for us (the GC model). Contains 5 text lessons, 1 audio lesson (54 min), 2 video lessons (71 min) + assignments. This is the step where all your hard work finally pays off. In Module 7 we show you how we decide whether to list with a real estate agent or do a for sale by owner. You will see how we use open houses, lock boxes, staging and other strategies to help find a buyer quickly, and uncover specific ways to sell for maximum profit. 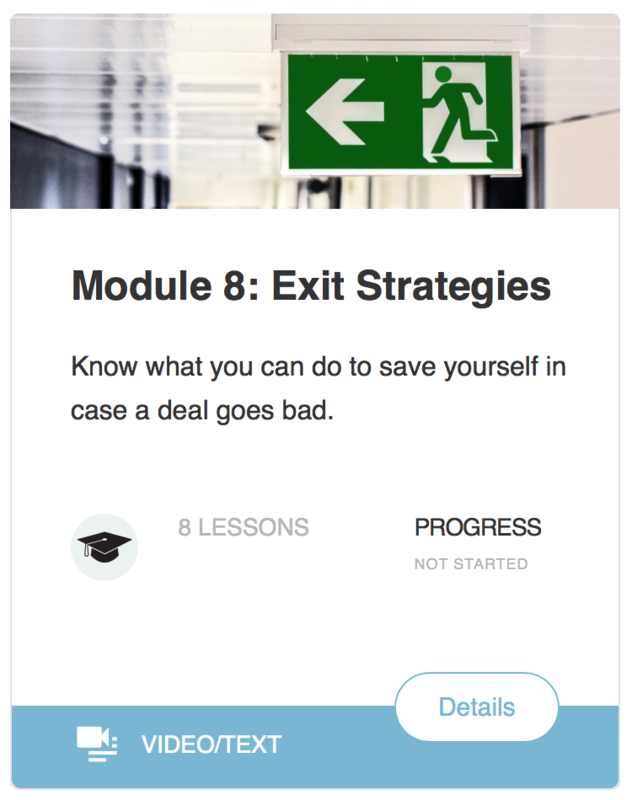 These exit strategies are only to be used in a worst case scenario. 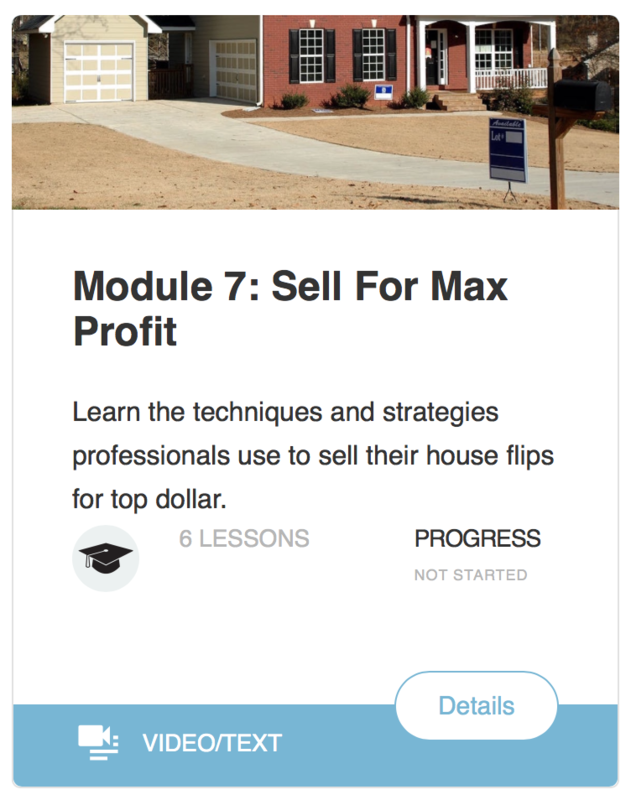 If the house is simply not selling, then using the techniques of this module can help. You will learn when we lower the price, how we use lease options and land lording, wholesaling and promissory notes. You should not find yourself in this scenario if you correctly follow our house flipping process. However we've decided to include these strategies for your own peace of mind. 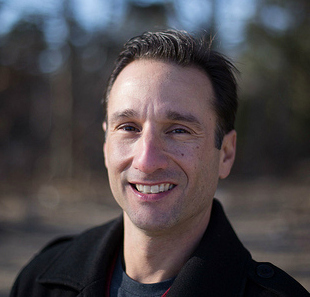 "Mike is a man of unquestionable character and integrity." "He helped me make $40,000 and I highly recommend him." "I'm in my new home because of Mike." "Mike is a knowledgeable business man, and an all-around great guy." "This week I'm looking for my first property-that is how psyched I am..."
"I would highly recommend House Flipping School. Mike and the HFS staff are as genuine as it gets"
You get the full 8 module Online Course which includes text, video and audio lessons. Plus we also provide the same forms & documents Mike uses to run his own house flipping businesses. 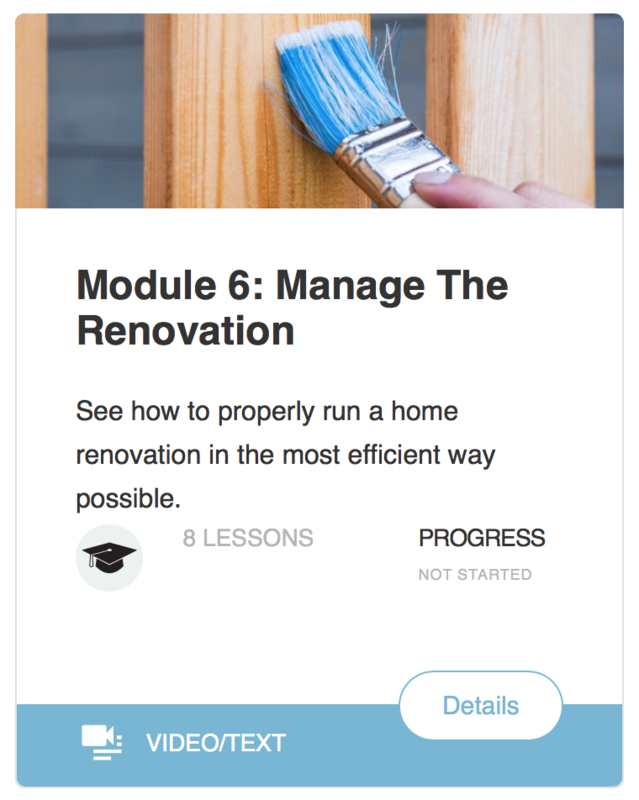 "The most affordable and simple house flipping education available." Learn the "must-know" information contained in our 8 module Online Course. 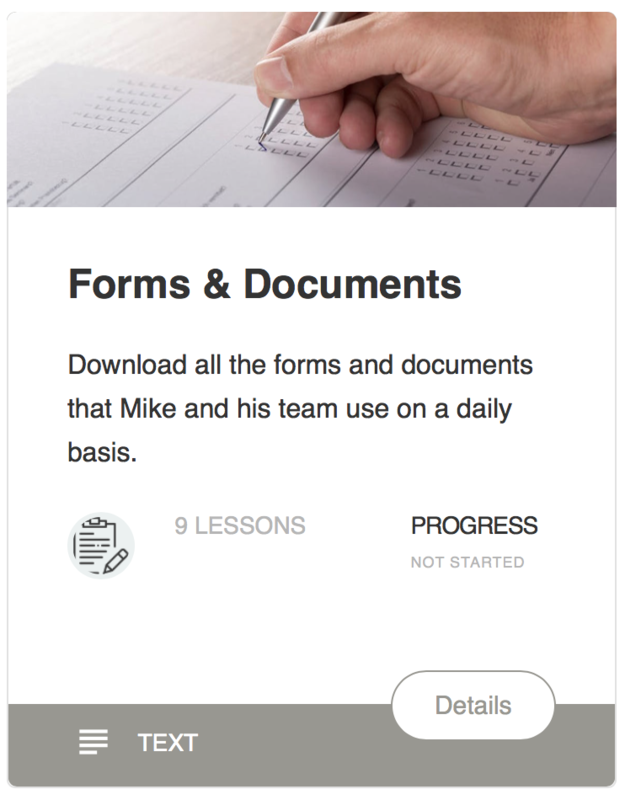 Integrate the forms and documents Mike uses into your own day-to-day house flipping business. Launch your house flipping education, make money and broaden your horizons. Help restore your community one house at a time. Sign up to lock in one year's tuition at our low introductory price of $495. *3 payments of $199, totaling $597. First payment will be drafted immediately, then you’ll be drafted on the date of purchase for the following 2 months. You are fully protected by our 100% Satisfaction-Guarantee. If you don't like what we offer over the next 7 days, then just let us know and we'll send you a prompt refund. "What a great group of guys you have put together at HFS..."
Everyone was so helpful every step of the way. I am fired up to begin my new venture. 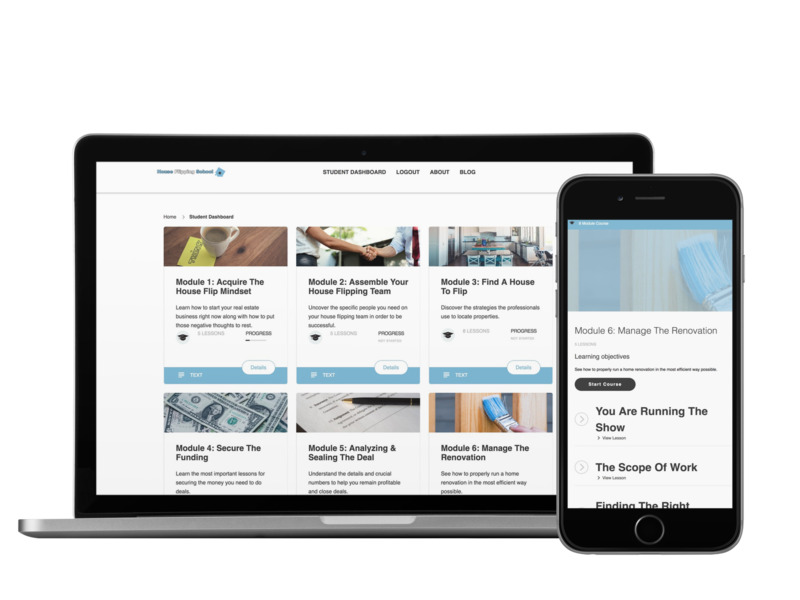 "Mike took everything I should know, and broke it down to something I could actually understand"
"I am motivated with clear and concise directions and tools, on how to begin my new career as a real estate investor." I now have the means to confidently assess property, contact general contractors, and look for financing. Mike backs up everything he teaches. Time is Money when Flipping Houses: Enroll today before the price goes up! We've already tested out many teaching models here at HFS, and if you've been with us since we launched in 2013, then you know what we mean. We've held weekend boot camps, published "how-to" manuals, coached students 1 on 1 and more. House flipping is not right for everyone, and that's nothing personal. Real estate is simply and absolutely not a "get rich quick" solution. By enrolling in House Flipping School, you will quickly discover what it takes to be successfull in this business, and uncover whether or not house flipping is right for you. We either want you to take action, or understand this is not your calling, before you make a mistake and lose money. Either way, enrolling with HFS is a win-win situation if you a seriously contemplating getting involved in this business! The introductory price of $495 is just that - an introductory price for the early go-getters. We will be raising tuition throughout 2018 as we continue to add more resources and value to the online course. By joining the course today, you will lock in the introductory price, and still get access to all future additions and updates - at a significantly lower tuition than students who join in the future. Can I really flip houses without using any of my own money? Yes! We teach our students how to raise money for their flips, including the purchase, holding, and renovation costs. Partnerships, bank loans, credit cards, hard money and other avenues are what we recommend. This is common real estate practice. The benefits are that you are using leverage and are not putting any or all of the money up to fund the real estate deal. However, like any investment there is risk and you can lose money. There are no guarantees, but our education can help you avoid rookie mistakes. Is your house flipping strategy legit? Yes. First and foremost we view house flipping as a means of rebuilding communities in need. Second, house flipping is a fantastic vehicle for acquiring wealth and personal freedom. ​Yet there are no short cuts in the flipping business. We encourage our students to work with expert, highly qualified and licensed attorneys, title companies, realtors, appraisers, mortgage lenders, and contractors. You also need to be aware of any state-specific laws that may affect how you market and operate your personal business. Do you guarantee that I will make money? No. But we guarantee to give you the information and tools you need as a foundation for making money. 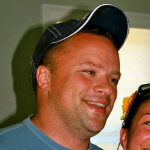 ​Mike's step-by-step strategy has helped him to earn a profit on nearly every single flip he has done. However, it's your responsibility to follow the system and it is possible for you to make costly mistakes. This is exactly why we started HFS. The goal of our education is to help you minimize the chances of something going astray, and cutting into your profits. Is it true I can flip houses in my spare time, or become a part-time investor? Yes, however your success ultimately lands on your own shoulders. Your level of responsibility and personal accountability is what will make or break your business. Will your system work in my market and in my geographic area? Yes, our principles work in any house flipping market. However, it is important to understand that each market is different. The core techniques taught in our course do work in all markets, but it is up to you to seek out local experts and professionals to help you validate your calculations. Is Mike actively investing, or just teaching? Mike is actively flipping at least one house per month. 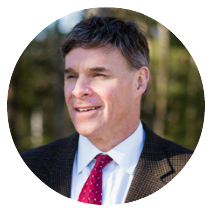 We believe this sets our education apart, because you will be learning from a guy who is primarily flipping houses and not running seminars.